2. Rosina Bulwer Lytton (1802-1882) was the wife of the immensely popular novelist Edward Bulwer-Lytton. Theirs was a love match, but the relationship hit the skids within eight years of their marriage. When her husband took up with other women, Rosina protested, and the result was a legal separation. The money settled on Rosina was scanty, however, and Bulwer-Lytton refused to come up with more, despite the fact that he was rolling in cash by this point in his career. Rosina took umbrage and found several ways to show her displeasure: the worst was when she appeared in public to denounce Bulwer-Lytton to his constituency when his appointment as Colonial Secretary under Lord Derby was put to the vote. Her outburst spurred Bulwer-Lytton to have her locked up in an insane asylum. Public outcry was so voluble, however, that she was released after three weeks in Dr. Gardiner Hill’s establishment for lunatics. Her grand-daughter was the early 20th-century suffragette and social reformer Constance Lytton. 3. John Thomas Perceval (1803-1876) was a founder and secretary of the Alleged Lunatics Friends Society, which lobbied for more humane treatment of the insane, and the son of the only prime minister of England to be assassinated (Spencer Perceval). Perceval may have witnessed his father’s murder in the House of Commons on May 11, 1812; in 1830, after a spell in the army, he succumbed to a religious mania and spent three years in two different private insane asylums, emerging in 1834. His account of his experiences in Brislington and Ticehurst Asylums make for harrowing reading. In 1962, anthropologist Gregory Bateson edited and published them as Perceval’s Narrative: a Patient’s Account of his Psychosis. her to Ireland, but she jumped from the window of a water-closet while at sea. She was saved from drowning, but she never recovered her sanity, despite Thackeray’s attempts to find a cure, and she ended her days some fifty years later, long after her husband’s death, as a resident in a private asylum at Chaillot, near Paris. 5. 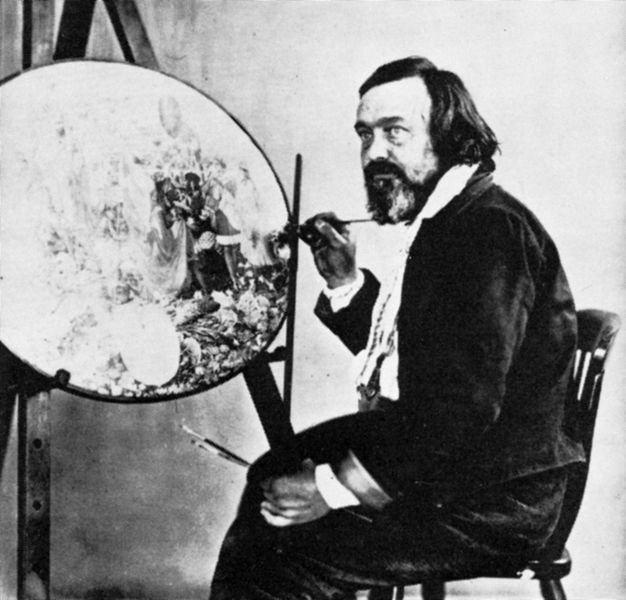 Richard Dadd (1817-1886), an artist of great promise, went to the Middle East with Sir Thomas Phillips, making sketches and pictures for Phillips to document his journey. Upon his return to England, however, his behavior grew increasingly eccentric, and, when his father met with him to urge him to submit to care, Dadd stabbed him to death. Escaping in his bloodstained clothes, he made it all the way to France. After attempting to kill a fellow carriage passenger, however, he was extradited to England, where he was sent to Bethlem Hospital. Although he never recovered, he was allowed to continue painting as therapy. Dr Suzanne Shumway is Professor of English and Speech at North Central Michigan College. She has a forthcoming chapter on Perceval’s Narrative in a book called Symptoms of Disorder: Reading Madness in British Literature 1744-1845 (Cambria Press), and she has written on various scholarly topics over the years since getting her Ph.D. from the University of Texas at Austin. Suzanne also writes about literature at her blog, The Tabard Inn. Image: Portrait of British painter Richard Dadd (1817-1886) painting Contradiction: Oberon and Titania. Photograph by Henry Hering (ca. 1856), public domain. We are all mad except for me and you and I am not so sure about you. A rose smells as sweet as can be even to a person who has no senses. Interesting Literature has a Gust Post by Suzanne Shumway that makes me glad to live in this era. Modern medicine has made a difference for so many. We still have miles to travel. Some shocking stories highlighted here. Great post! Thanks for the feedback. The funny thing is that in the 19th century, they thought of themselves as advanced and lamented the barbarity of earlier treatments for insanity. They weren’t particularly vacation spots either. I shudder to think how they suffered. One of my friends is a descendant of the Lyttons. I think I’ll send this to him. Wasn’t the poet John Clare another who spent time in an asylum ? Oh, yes, Lady Fancifull–you’re absolutely right! When you get right down to it, it’s amazing how many people actually had first-hand experience with insanity. Clare was a brilliant poet from the lower classes, kind of an English Robert Burns, but ended his days in an asylum. This is so depressing. Sad how many people had to suffer in insane asylums whether they needed to be there or not. Seems to me nothing good came out of their stay there. No help, that is. always found Lambs’ story fascinating…so sad. Goodness, these five reach beyond Girl Interrupted. Absurd and interesting! Reblogged this on mary morrissy – writer. Interesting! I work at a psych hospital so this history fascinates me. I know your period of specialization is 19th century, not 20th, but are you aware of T.S. Eliot’s wife Vivien being locked up in an asylum–for life? Very sad story.